90 million stay-at-homes is a startling number. Moore hopes to inspire readers to find a non-voter and get him or her to the polling station on Tuesday. It is not going to be easy. And I can speak with authority because I am so dismayed at the campaign monies spent that I have toyed with sacrificing my vote to the North Wind and voting for a third-party candidate. Absenting myself from the process was a fleeting thought. In the end, I mailed my ballot, but I didn’t feel particularly good about it. Only my up-bringing… my parents and former teachers whispering in my ear needled me into doing the right thing. Not voting is not an option. I have any number of issues, but the issue that applies to both parties is the total amount of money spent on the 2012 campaign. Estimates range as high as five billion dollars. Imagine what you could do with that kind of money. If only I had a dollar for each piece of campaign literature that I have received through the mail. Just when people are forsaking snail mail for tweets and email, just when the U.S. Postal Service is on the brink of insolvency, a General Election comes to the rescue. I have received more mail in the last month than I have in the past year. I have received letters, posters, and yard signs. 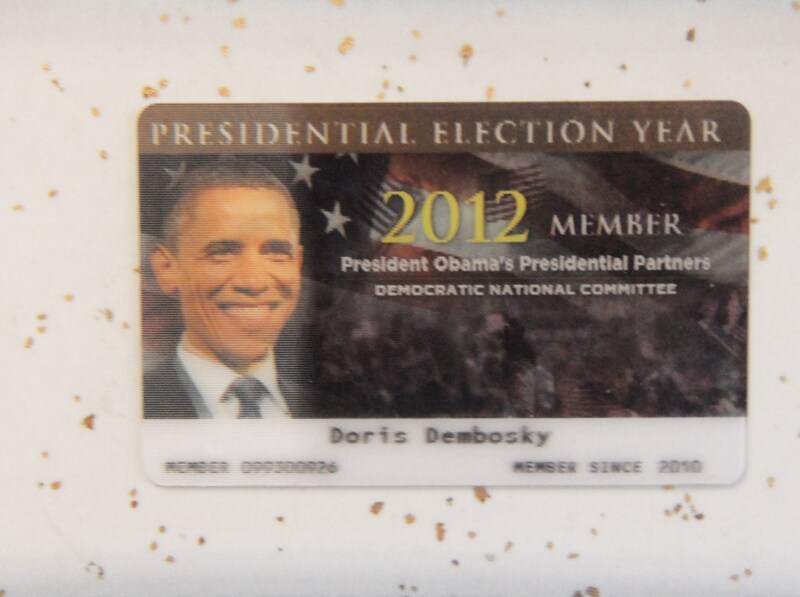 I have received buttons, a name tag identifying me as an honorary delegate to the Democratic Convention, and a plastic-coated business card of President Obama whose photo is holographic. Tip the card one way and he smiles; tip the card in the opposite direction, and he looks presidential. I have received numerous photographs: Obama. Obama with Michelle. Obama and Michelle with the kids. Obama and Clinton hugging like long-lost brothers. And my favorite, Obama, white shirt sleeves rolled up, suit coat over his shoulder, hunkered down outside his office to pet the family dog, Bo. At the bottom of the 8 by 11, a note reads, “To Doris, On behalf of Bo and myself, please accept our gratitude and thanks… ” Who could say, “No,” to Bo? Certainly not a dog lover. I have received a mailing tube containing a rolled up map of the United States. Sticky notes with relevant statistics are affixed to the swing states. This week I received a Postal Service priority envelope. Within the large priority envelope was a smaller priority envelope in which I could place my last-minute contribution. Enough already! All these mailings and vacuous, stone-throwing, sound-bite commercials depress me. Least you think that I am unduly picking on the Democrats, let me hasten to say that as a registered Democrat, I am the one they target. If I were a registered Republican, they would spend an equal amount of money on me. I am truly unhappy about the campaign money spent by both parties which (if you think of money in terms of ammunition) are in a fight-to-the-death. I find the one billion spent on ads to be aired before Election Day to be obscene. When I think of all the places that money could be better spent, I am almost physically ill. When is someone going to take reforming campaign finance seriously? We seem to acknowledge and fear “arms escalation”; why can’t we acknowledge “campaign finance escalation”? I’ve given money, and I’ve given again. I feel as though a gun is pointed at my head. Either I fork over some money or my candidate is in danger of losing. It’s a hold-up, and my inclination is to duck and run. Like me, you may feel used and abused, but don’t number yourself among the 90 million who may refrain from voting. Vote this November and come the New Year, let’s rant and rave about reforming campaign finance. This entry was posted in Uncategorized and tagged "Money, Abba, Campaign finance reform, Michael Moore. Bookmark the permalink. Thank you for writing. It is nice to know that I’m not alone. Loved our hour at Candy’s.